The bicycle. Arguably for some it is held as the best invention since sliced bread. A wonderful contraption that contributed to fond memories of playing and racing around after school on mild summer evenings. We are all familiar with road racing, the Tour De France, BMX stunts and mountain biking, but for the adrenaline junkies seeking more thrill and adventure Downhill Mountain Biking is a perfect combination of speed, jumps and stunts, and is actually classed as an extreme sport! It involves the participants racing down a hill on a purpose built track while riding a specially developed bike to deal with all the roots, rocks and bumps the rider will encounter. The skills that rider has will help tackle these obstacles. Protective gear is essential, including body armour, knee pads, elbow pads, helmets, goggles and sometimes a neck brace as an extra precaution. It is a relatively new and popularised sport, so the ladies categories are easier to work up the rankings in comparison to the mens. Meet Sumayyah Green, 16 years old, originally from London and a Muslim hijabi girl who loves her bike and competes in races across the country in this crazy sport . She has been riding for two years and gave a glimpse into her experience riding and competing, the fears she faces and the mental strength it takes to finish the race. How did you get into downhill mountain biking? As a young child I would often go riding with my dad, older brother and two sisters at Surrey Hills. I loved it- well the downhill bit! We moved house and after a while I stopped riding at the age of 8. My brother on the other hand didn't, he still went on rides with my dad. Six years later we moved house again this time to the countryside. This is when my brother started to get into downhill, he started to race and I would watch. One day my dad and brother suggested that I should start riding again and try out racing, I was stubborn toward the idea considering I have not ridden a bike for seven and a half years. After an immense amount of persuading I reconsidered. We drove down to our local trails at Aston Hill. I was nervous but I started with the easiest part of the track with my brother's help. I had forgotten how exhilarating riding was. I got more confident remembering the fond memories of my childhood rides. By the end of the day I had made my decision to start riding again. My dad brought me my first downhill bike and entered me into races. The race track specially marked out. What scares you most about riding? Facing the fact of how badly I could get injured. Getting injured can affect my riding and my body physically as well as mentally, downhill takes a lot of mental strength and without mental strength no one gets far in this sport. It takes one simple crash or a silly mistake and I could break a bone or have a bruised leg for a week. Yes I do wear body amour but the amount of speed that can be gained and the amount of trees and rocks in the way make it just as easy to get injured. How do you conquer those fears? I try not to think about too much and throw the thoughts to the back of my mind. Again it’s all about mental strength. I think about all the positive things that can come out of what I do and stay in that positive mind set. A rocky drop that would intimidate most mountain bikers. Sumayyah rides down these while trying to get the fastest time possible, the faster you get to the bottom the more likely you are to win. How do you deal with wearing hijab especially in hot weather? At first I found it very hard as I was not used to doing a sport like this in my hijab. After a while I got used to it, the clothes I wear are especially designed for downhill biking. They are light-weight so you do not over heat and the clothes are also baggy and modest. Sometimes in hot weather it is hard to wear my hijab but then again I just get used to it and have a cold drink to cool me down. Berms are built into the track to provide variety and test the riders skills. The sport makes me feel alive. For me racing makes the sport all the more exciting, its the feeling I get when I'm at the start line ready for my race run. On a race weekend it's great to be in such an amazing atmosphere talking to my friends and making new ones. The fact that there is something to constantly challenge myself with motivates me to carry on. Feeling the adrenaline and satisfaction of winning really makes me want to get out there and ride. I have won thirteen or so races out of twenty-seven, I have come top five in most of the other races apart from a few. What obstacles do you face personally, mentally or physically? Mental strength is very important so is physical strength. I have to train in the gym, lifting weights and doing other exercises to get fit so when I race or ride I don’t get tired. When riding it is very physical and takes time to get up to prime fitness. It is the same concept with mental strength as well you have to train your mind set, be positive and stay focused. 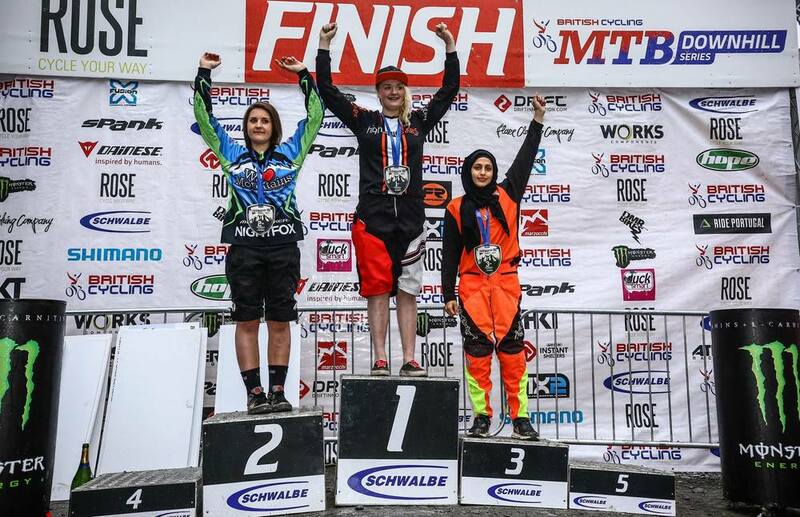 3rd place is a great achievement for Sumayyah, especially for her first year racing in The British Downhill Series (BDS). Do you take Downhill Mountain Biking seriously? Yes, I want to race downhill as my future career. I would like to get sponsored by a World Cup race team, race World Cups full time and get the opportunity to Win World Cups and be the overall winner. Along with being the Downhill World Champion. More than that, to be the first Muslim woman to race World Cups and be at the top of the sport. At the same time inspiring young women around the world. It’s quite simple. You need a bike for starters then find a place to ride. Not too much of a technical track. If you start off with something you cannot do then it won’t be any fun. You can then build up your skills from there and maybe enter some races. To enter race go to British cycling, enter a race and have fun! Some riders have more style and incorporate more jumps into their race run. What advice would you give to young Muslim women? If you want to do something you enjoy, do it! Don’t hold back, it doesn't mean you wear hijab that you can’t do what you want to- do what you want. There are so many women out there doing amazing things. Visit the website where Sumayyah writes about her biking experiences HERE. Photo Credit: Yasmeen Green. Visit her page for her photography HERE.